Every year people order past the cutoff date. Custom orders usually takes 2-4 weeks for production. Our seat cover elves are working around the clock to get all orders out as soon as possible. Note: This is our most popular option. 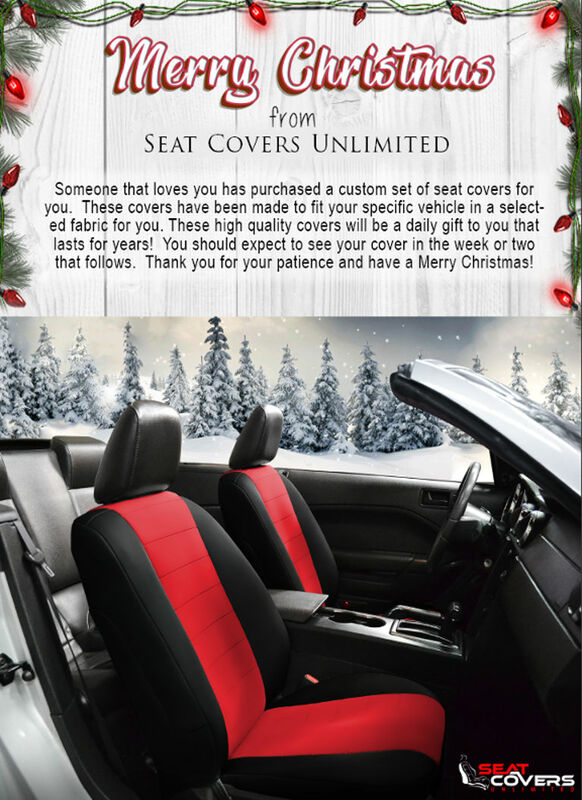 Proceed and place an order then download a picture of the seat covers you have ordered. Tell your loved one that it is on the way, and will arrive shortly after Christmas. This saves shipping costs and allows you to spend more on your loved one rather than give it to the shipping companies. You can order a Gift Certificate on the website and present it to your loved ones. That way they can choose what they want. If you selected a custom seat cover which is guaranteed to fit for your vehicle, we also offer universal fit covers that fit most trucks, cars, and SUVs. These ship within two days and will get to you faster than a custom order. May you and your loved ones have a Merry Christmas and a Happy New Year! !